Expect to be impressed with this 5 bdrms, 4 baths, 8 yr old custom built home w/amazing view of the South Thompson river. 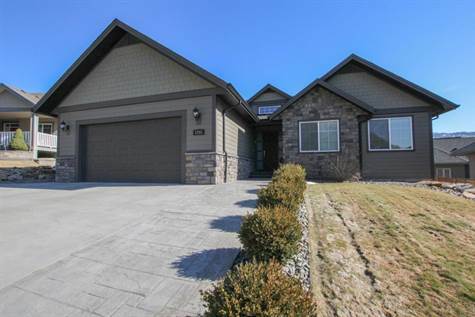 Stunning open design with over 4000 sqft of living space and vaulted ceilings. Chef's kitchen features lrg island, SS appliances, quartz countertops, gas range, soft closing cabinets, pantry + a W/I pantry. Din area and spacious living room w/tiled fireplace have lrg windows for plenty of nat light and access to 30X14 half covered/uncovered concrete tiled deck to maximize the beautiful view. Sizable mst bdrm has dream W/I closet and luxurious 5pce ensuite w/soaker tub, W/I tile shower and dual sinks. Main mostly tile and hardwood. Inviting tiled foyer. Bsmt has an equipped theatre room w/projection screen, wet bar and a 2 pce bath + a spacious 2bdrm (both with W/I closets) self contained in-law suite with sep laundry/access that is perfect for the in-laws or extended family members. The yard is beautifully landscaped and fenced. This home has it all and must be seen. Includes appliances, B/I Vac, AC, irrigation system, double garage, heated tile floors in ensuite and main bathroom. Furnishings negotiable. All meas. approx.